Brined, smoked, & deep fried chicken wings. Sprinkled with house rub & drizzled with Alabama white sauce & BBQ. House made potato chips, pulled pork, queso, pico, corn salsa, candied jalapeños, pickled red onions, sour cream. Sweet banana peppers, candied jalapeños, hand breaded & deep fried. Served with roots sauce. Thick cut, beer battered, sprinkled with house rub & served with Alabama white sauce. 6 deviled eggs: sweet sorghum deviled eggs with red pepper bacon marmalade & 3 deep fried spicy deviled eggs, topped with smoked paprika. House made pimento cheese, deep fried & topped with red pepper, bacon marmalade. Mixed greens, chopped egg, tomatoes, cucumber, crispy black eyed peas, cheese, & golden fried chicken tenders. Mixed greens, tomatoes, chopped egg, cheese, cucumber, crispy black eyed peas, applewood smoked bacon, Clift y Farm’s® country ham, & Kentucky Legend® city ham. Arcadian mixed greens, apples, dried cranberries, feta cheese, topped with seared salmon. Chopped romaine, applewood smoked bacon, tomatoes & cornbread croutons. Tossed in creamy ranch. Mixed greens, tomatoes, chopped egg, cheese, bacon, cucumber, crispy black eyed peas & cornbread croutons. 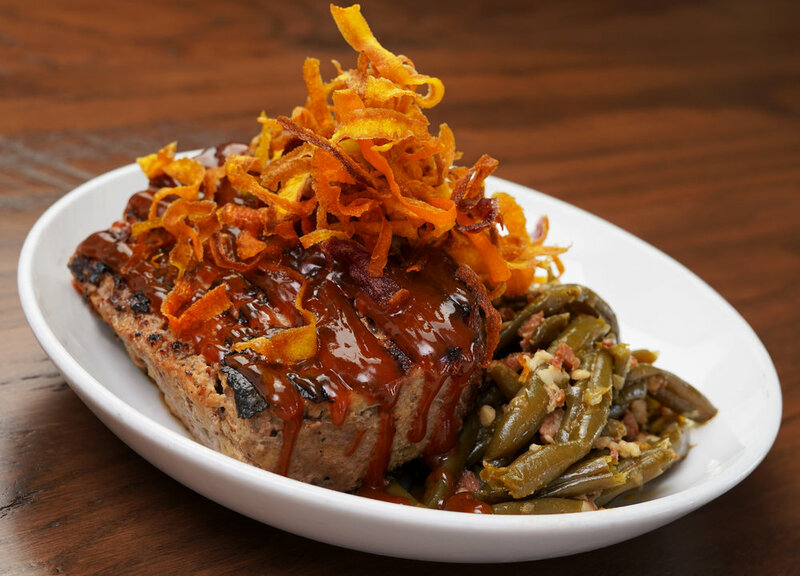 Your choice of meat & two fresh sides. Open-faced roast beef sandwich in a bed of smashed potatoes, smothered in Henderson Brewing Co.® sweet brown gravy. Clifty Farm’s® country ham, smoked turkey, applewood smoked bacon, sliced tomato & smothered in smoked gouda mornay. Cornbread waffle, Nashville hot fried chicken, honey butter, side of hot honey. White cheddar cheese grits, gulf shrimp in a tasso ham gravy, topped with tomatoes & scallions. 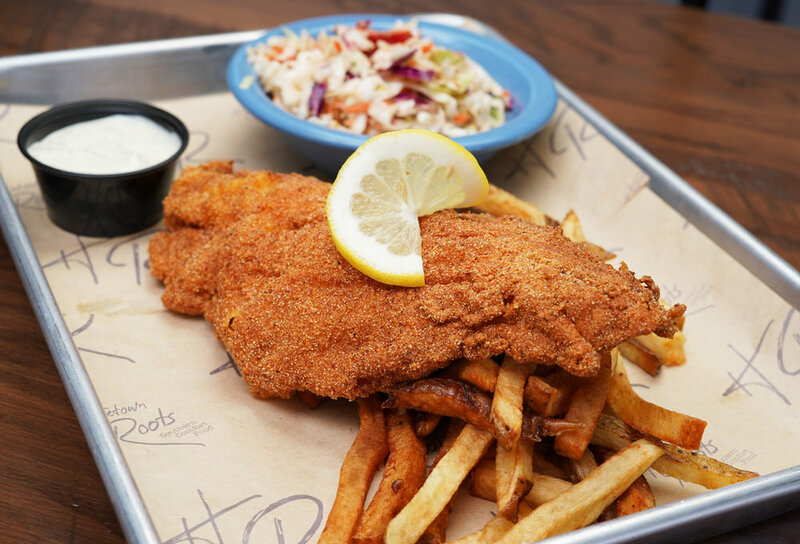 Cornmeal-dusted Mississippi catfish, hand cut fries, slaw, & tartar. Hand-breaded chicken fingers, hand cut fries and slaw. Hand-breaded gulf shrimp, hand cut fries, slaw & cocktail. Creamy white cheddar cheese, Buffalo chicken, with a buttermilk ranch & buffalo drizzle. Creamy smoked guoda cheese sauce, topped with slow-smoked brisket drizzled with BBQ sauce. Roasted caulifl ower, broccoli, tomatoes, mushrooms, in white cheddar sauce. Topped with pickles & cajun slaw. Hand breaded, deep fried, tossed in buffalo sauce, & served on an onion roll with lettuce & tomato. Burnt ends, sloppy joe style, banana peppers, & white cheddar cheese. Served on texas toast. BBQ pork, Kentucky Legend® city ham, white cheddar, spicy pickles, mustard aioli. Fried shrimp, spicy remoulade, lettuce & tomatoes. Kentucky Proud® beef, American cheese, roots sauce, lettuce & tomato.